November 11 is Remembrance Day (also known as Poppy Day) in the Commonwealth of Nations and some other countries. This day commemorates the end of the World War I.
Remembrance Day was created to remember the soldiers who died in the line of duty. The day was designated by King George on November 7 in 1919. Non-Commonwealth countries recognized other special days for war remembrance services. 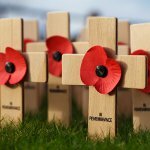 Remembrance Day is observed on an international level on November 11, as far as the hostilities formally ended at the eleventh hour of the eleventh day of the eleventh month. But the official end of World War I was on June 28, 1919 when the Treaty of Versailles was signed. A red poppy flower became a familiar emblem of Remembrance Day, that was promoted by the poem In Flanders Fields. Poppies bloomed across some of the worst battlefields of Flanders and their bright red color was associated with the blood spilled in the war. Remembrance Day is a public holiday in Canada, France, Commonwealth of Nations. In the United Kingdom and in Commonwealth the main observance of the day is on the Sunday nearest to November 11. Two minutes of silence on Remembrance Day and Remembrance Sunday are a traditional observance.